Dr. Charles Bishop of Bangor University's School of Biological Sciences led the study, along with colleagues Robin Spivey and Dr. Lucy Hawkes (now at University of Exeter), Professor Pat Butler from the University of Birmingham, Dr. Nyambayar Batbayar (Wildlife Science and Conservation Center of Mongolia) Dr. Graham Scott (McMaster University) and an international team from Canada, Australia, Germany and the USA. The study used custom-designed data loggers to monitor pressure-derived altitude, body accelerations and heart rate of geese during their southern migration from their breeding grounds in Mongolia to their wintering grounds in South-eastern Tibet or India. Historically, it was commonly assumed that bar-headed geese would fly to high altitudes relatively easily and then remain there during their flights, possibly benefitting from a tailwind. Instead, the new study (published in Science 16th January 2015) shows that the geese perform a sort of roller coaster ride through the mountains, essentially tracking the underlying terrain even if this means repeatedly shedding hard-won altitude only to have to regain height later in the same or subsequent flight. 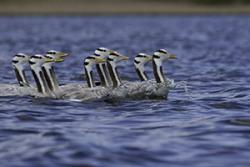 Bar-headed geese perform a sort of roller coaster ride to cross the Tibetan plateau and Himalayas. : image credit Nyambayar BatbayarThe birds adopt this roller coaster strategy as flying at progressively higher altitudes becomes more difficult, as the decreasing air density reduces the bird’s ability to produce the lift and thrust required to maintain flight. The birds also face the problem of reduced oxygen availability as the atmospheric pressure falls from 100% at sea level (with oxygen content of 21%), to around 50% at 5500 m (equivalent to 10.5% oxygen at sea level) and near 33% at the top of Mt. Everest (equivalent to 7% oxygen at sea level). The new study showed that the wingbeat frequency of bar-headed geese gradually increased with altitude and reduced air density but was very precisely regulated during each flight and with a typical variation of only 0.6 flaps per second. Remarkably, heart rate was very highly correlated with wingbeat frequency but there is a very steep exponential relationship. For example, a small change in wingbeat frequency of +5% would result in a large elevation in heart rate of 19% and a massive 41% increase in estimated flight power. 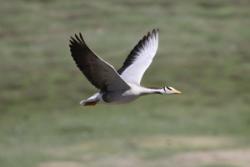 Article: The roller coaster flight strategy of bar-headed geese conserves energy during Himalayan migrations, by Charles M Bishop et al. (2015) Science, 16th January.